We have over the years seen other organisations and also other Quota Clubs present an award for community service. This year we have decided to have our first Woman of the Year Award. Each year we will be selecting a member of the community for their outstanding services to the community. This year our inaugural year we have chosen to give this award to Zena Kennedy. Over the past few years Zena has given her time to Quota at their yearly Craft and Gift Fairs. She volunteers her time teaching cards for Bluecare and at Ronald McDonald House in Herston. She organises charity events to raise funds for many charities. Her cards have been packed and sent over Queensland and as far as Myanmar in Burma. A lady that loves what she does and is always ready to help. 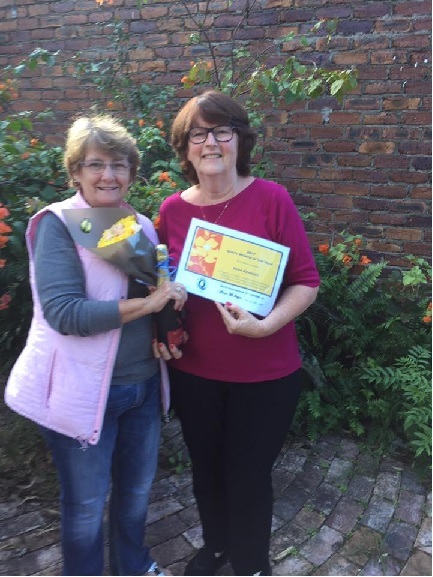 Janette presented Zena with the award, along with a bottle of bubbly and a bunch of roses. Thank you for your support over the years and for all you do for others.